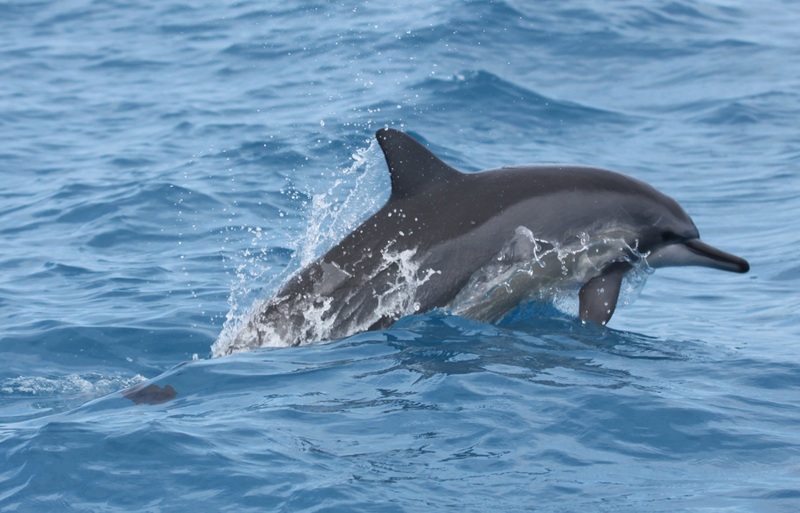 The Papahānaumokuākea Associated Cetacean Ecology Survey (PACES) had another productive week during Week 2. If you recall from the Week 1 Field Report, we ended the first week with 15 visual sightings and 27 acoustic detections of cetaceans. With the close of the second week, we are now up to 35 sightings and 62 detections within the surveyed portion of the Papahāhaumokuākea Marine National Monument (PMNM). 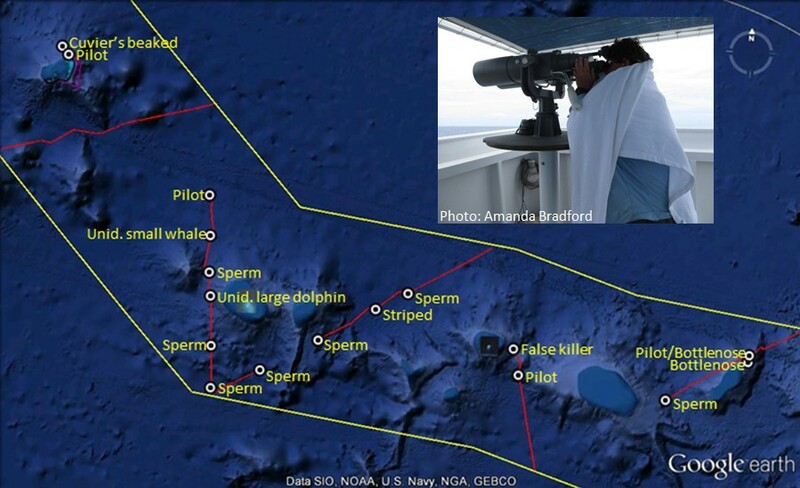 During my previous (and first) stint as a PIFSC Chief Scientist – on a 30-day cetacean survey of the U.S. EEZ around Palmyra Atoll – we saw and heard a total of 28 and 55 cetacean groups, respectively. On that survey, we launched the small boat twice for cetacean work. To date on PACES, we have made five small boat launches to approach or survey for cetaceans. The amount of data rolling in is extremely exciting, but it has made for some long days! Fortunately, the PACES team, to a person, consists of talented, dedicated, and hard-working individuals. Their vast knowledge, attention to detail, and forfeited naps have not gone unnoticed and are very much appreciated. Members of the visual and acoustic teams join forces on the flying bridge of the NOAA ship Oscar Elton Sette to help the small boat track an evasive group of pilot whales. Sperm whales, pilot whales, and other deep diving cetaceans were the theme of the week. The flying bridge crew muscled through numerous 60-minute group size estimates for sperm whales, working closely with the acoustics team to best determine the numbers of whales in each group encountered. Because sperm whales can dive for so long (sometimes for over an hour), special techniques are used in order to count them. The flying bridge observers do a 10-minute estimate, and then a 60-minute estimate, in order to best see and count all the whales during their relatively short time at the surface. This week also brought a circumnavigation around Pearl and Hermes Atoll on 20 May, where our Chief Scientist added a new species to her cetacean life list, Cuvier’s beaked whale, another deep-diving animal. In other words, she owes those of us working on the flying bridge at the time a beverage of our choice. Operations are running very smoothly, even with several very windy days (note that even Allan has resorted to wearing long sleeves and other warm garments), but we are all hoping the current nice weather lasts until the end of the cruise. In total, there were 20 sightings (17 seen first from the ship and 3 seen only from the small boat) of at least seven species dispersed over the five transect lines covered and the Pearl and Hermes circumnavigation. Ship-based sightings of cetaceans made on completed tracklines (red lines are standard survey effort, purple lines are nonstandard survey effort) during the second week of PACES. Map covers the PMNM (yellow boundary) from Raita Bank in the east to Pearl and Hermes Atoll in the west. Inset picture shows Allan in his newly-adopted Hawaii working attire. Week 2 brought 35 acoustic detections of cetaceans, including 17 sperm whale detections! New species acoustically-detected for PACES include Cuvier’s beaked whale, which produce a high-frequency click that occurs between 30-40 kHz, and pilot whales, which have a variety of mid- and high-frequency vocalizations. 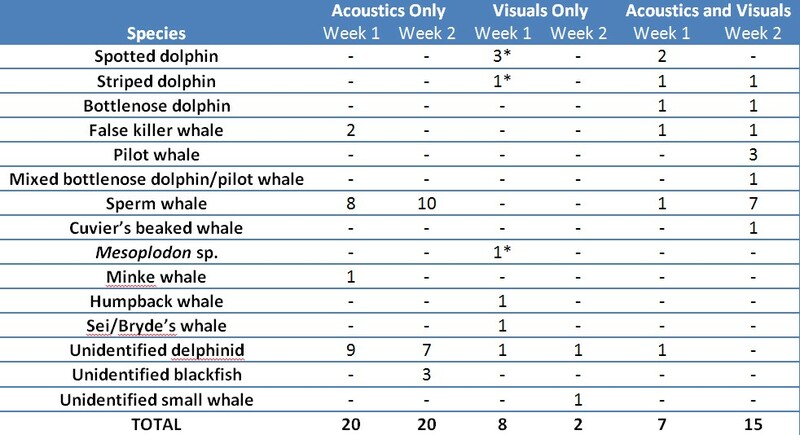 Summary of ship-based acoustic and visual cetacean detections made during the first two weeks of PACES; sightings with a * were made on 8-9 May before acoustic monitoring began. The localization test to assess the accuracy of the multi-node hydrophone array was performed on 17 May. At the start of the experiment, the small boat and ship were separated by 5 nmi with the small boat 1 nmi off the trackline. The small boat acted as a stationary sound source using an underwater speaker to emit synthesized whistles, as well as real sperm whale and bottlenose dolphin clicks. To avoid inadvertent exposure of cetaceans to the playback sounds, the presence of any cetaceans was monitored acoustically and visually during the experiment. If animals were found within 5 nmi, we would have ended the experiment. None were seen or heard during the experiment. The acoustics team immediately heard the synthesized whistles playing from the underwater speaker, but the clicks were difficult to hear until the sound source was closer. However, the bearings that were obtained acoustically did not match those obtained visually until the sound source reached 30-40 degrees. At this point, the bearings from both the visual observers and the towed hydrophone array matched up within 5 degrees. The estimated distances produced from the convergence of acoustic bearings did not match the observed distances until bearings of 60-70 degrees were plotted. Before this point, the distances were over-estimated by at least 1 nmi. The data from this test will be further analyzed after PACES, and the results will help in the design of future hydrophone arrays. New passive acoustic software exists offering automatic localization methods, which will also be tested and evaluated using these data. The CARB, our Compact Acoustic Recording Buoy, took its maiden voyage this week, as we deployed it from the small boat in the lagoon of Pearl and Hermes Atoll on 20 May. We were hoping to record the spinner dolphins that we sighted in the small boat channel. Sadly, a technical glitch occurred during deployment, and no spinner dolphins were recorded. It’s a disappointing setback and troubleshooting is ongoing. On the bright side, the underwater housing used to encase the internal components of the recording system did not leak, and all equipment was successfully retrieved. Over 1,200 photos were taken in Week 2 during nine sightings of five cetacean species, including spinner and bottlenose dolphins and false killer, pilot, and sperm whales. The small boat was launched three times in association with four ship-based sightings, two of pilot whales and one each of bottlenose dolphins and false killer whales. One of the pilot whale groups (14 May, near Maro Reef) was difficult to approach even for photos; photo-identification images were obtained of the second group (15 May, near Laysan Island). In addition to photo-identification images, two biopsy samples were collected from the bottlenose dolphins (14 May, near Maro Reef). Two additional biopsy samples were collected of this group from the ship when some individuals began to bow ride. The most successful sighting-associated launch was on our target species, false killer whales. When this group of about 20 individuals was approached near Laysan on 15 May, over 200 photos were taken, four biopsy samples were collected, and a satellite tag was deployed. False killer whale satellite tagged off Laysan Island and its movements from the day of tagging (15 May) through 20 May (white star). The movement track (turquoise line) is based on raw data, such that some positions may change or be eliminated following appropriate quality checking and data processing. On 20 May, the small boat was launched for a nearshore circumnavigation of Pearl and Hermes Atoll. Only a few cetacean groups were encountered, but these included bottlenose and spinner dolphins, as well as an unidentified dolphin that moved quickly away from the small boat and was not resighted. Photo-identification images were taken of the bottlenose and spinner dolphins, and six biopsy samples were collected from the spinners. In total, small boat operations during the second week of PACES (not counting the array localization test) spanned just over 17 hours and 150 km of effort. Overview of activities conducted around Pearl and Hermes Atoll on 20 May. In addition to the ship survey (purple line) and sightings (target circles) and small boat survey (white line) and sightings (yellow stars), a previously-deployed High-frequency Acoustic Recording Package (HARP) was retrieved (right picture) and a new HARP was deployed. HARPs sit on the sea floor for long periods and collect acoustic data on cetacean presence and occupancy in the area. A spinner dolphin, part of a group of about 75 individuals, inside the lagoon at Pearl and Hermes Atoll. Photo credit: Andrea Bendlin. Permit number: 15240. The Oceanography team had a successful second week of sampling. CTDs were performed 1-2 times per day before sunrise and just after sunset, with daily water samples collected from 12 consecutive depths ranging from the surface to 1,000 m. XBTs and surface water samples have been collected 3-4 times daily, sometimes overlapping with cetaceans sightings. The sightings for which we have accompanying oceanography data for this week include: #17 of bottlenose dolphins, #19 of pilot whales, #20 of false killer whales, #21 of sperm whales, #22 of spotted dolphins, #23 of sperm whales, #28 of sperm whales, #33 of pilot whales, and #34 Cuvier’s beaked whales. Summary of oceanography stations during the firsttwo weeks of PACES. BioTech Louise Giuseffi is performing quality control and entering CTD, XBT, and surface sample data daily. 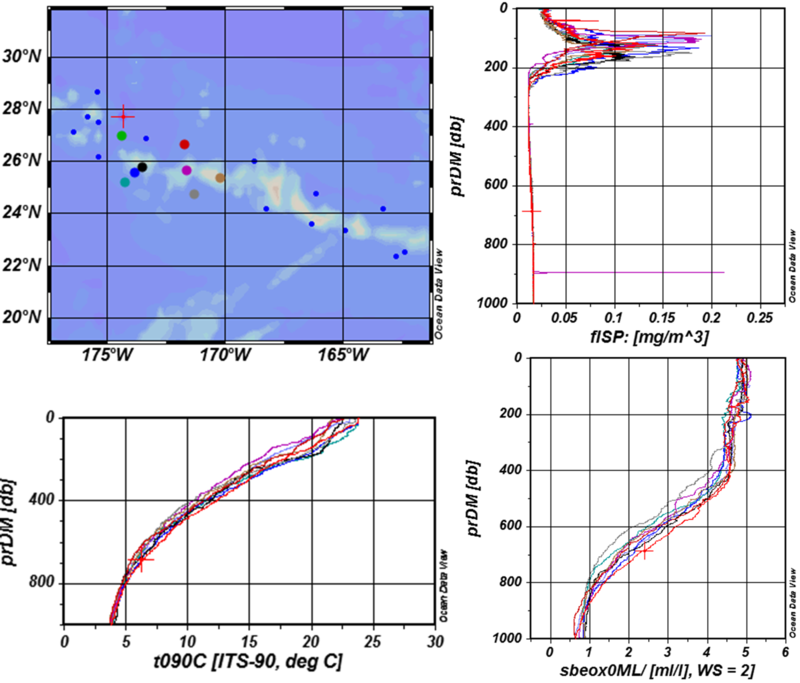 Survey Tech Robert Spina plotted CTD sensor data in Ocean Data View 4 (ODV), with a subset of the data pictured below. Note that the stations highlighted on the map with various colors are represented on the sensor graphs as corresponding lines. Smaller blue dots represent unhighlighted data from Week 1 and Week 3 stations. PACES Week 2 CTD stations, with panels showing chlorophyll content (upper right), temperature (lower left), and dissolved oxygen (lower right) from the surface to 1,000 m.
This entry was posted in Protected Species. Bookmark the permalink.